"We work peacefully while recognizing there is no true peace without justice and equity for all," reads the Vision and Mission page of the recent Women's March on Washington. It then lays out their Guiding Principles of Kingian nonviolence, which include statements that "Nonviolence is a way of life for courageous people," along with a plea to "avoid internal violence of the spirit as well as external physical violence." 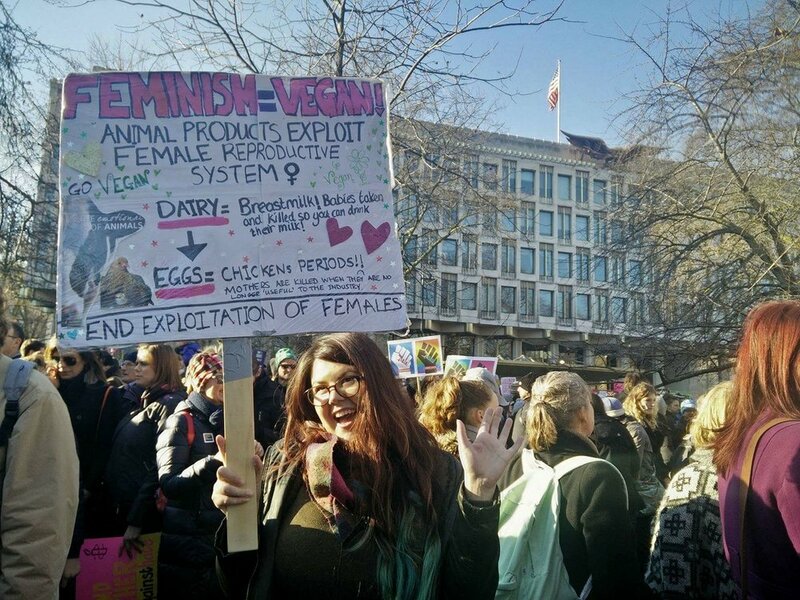 The glaring disconnect here is that the vast majority of people in attendance make daily choices that are in direct opposition to these principles, because the entire animal industry is built on the violent exploitation of the female reproductive system – yet the vast majority of people in attendance were not vegan. I'm really not saying this to be a jerkball, but it doesn't behoove anyone to be silent about it. Many women are voicing that they didn’t need this march, to which many others are responding that privilege is invisible to those who have it. Most march participants aren’t vegan, because they don’t believe they need to be vegan. This is because their largely unquestioned privilege to exploit animals, and the far-reaching catastrophic consequences of that choice, are still cheerfully invisible to them. I was once as guilty as anyone. The walls whose construction and reinforcement we fund are those of slaughterhouses. That's where we betray, restrain, and attack helpless sentient beings so we can take from their bodies what we don't need. These walls ensure this is all happening outside of both our view and our consciousness. Along with our cognitive dissonance, these walls keep us in denial, complicit in things that would cause otherwise progressive people to recoil in horror and protest with fervor if we could only see. If we would only look. So yeah. You may find yourself marching for females while exploiting and consuming the most vulnerable of female (and male) bodies, including mothers and their offspring. It happens. But when we know better, we can do better. Please practice what you preach, do the research you need to do, and begin to live vegan. Below is a sampling of powerful vegan signs at various locations of the Women's March held this weekend. The photos link to where I saw them posted. Please truly consider their messages – and know that they were putting themselves out there even among other proponents of social justice, and subjecting themselves to uncomfortable scrutiny and conversations, only because it matters so damn much. Serious kudos to everyone who showed up for women, regardless of whether you've yet connected your feminism to its logical vegan conclusion. I know you will. But please don't wait another moment. Posted on Reddit: "She's holding two signs: one with a photo of a pig in a gestation crate with the text "She spends her entire life pregnant and in a cage... We represent all abused women." The other sign that she's displaying next to it says "Ask me how you can be a better feminist." 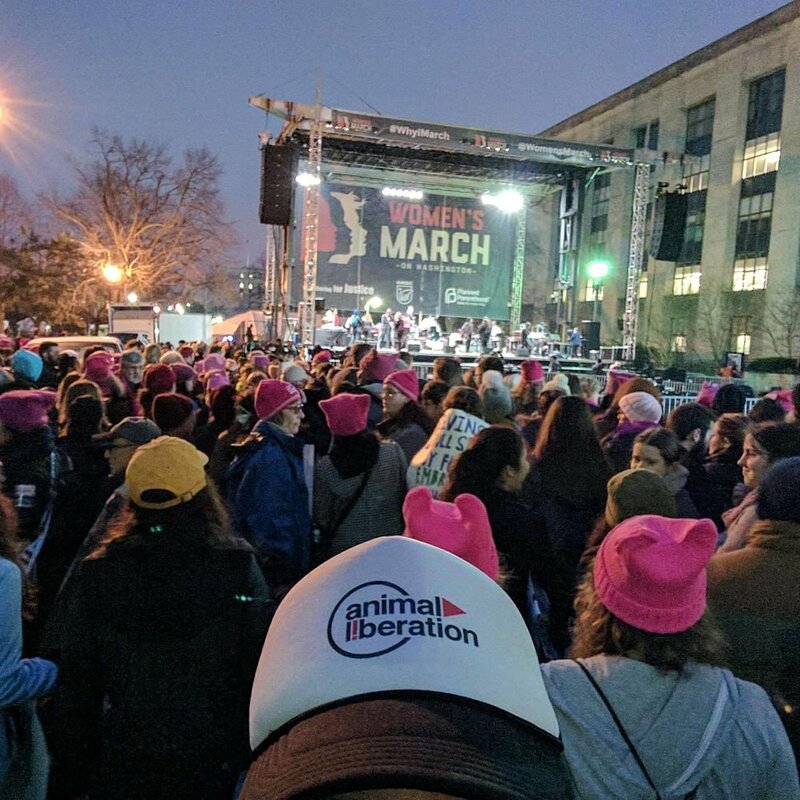 Adding Animal Rights to the March Mix!In DC at the Womensmarch with a crew of environmentalists and animal lovers! Mercy For Animals' Nathan Runkle, actresses Elaine Hendrix &Lori Alan & Dancing with the Stars' Tom Bergeron & author Laura Robinson Oatman talk to Jane Velez-Mitchell about how animal rights fits into other social justice movements like #womensrights #humanrights#AnimalRights #StopClimateCarnage#JaneUnChained #vegan — with Laura Robinson Oatman and Annalise Oatman. My hope is that everyone marching today, as well as those who could not, or did not want to join, believe in their signs and chants and will keep fighting and making a difference. No one should feel like they did their civic duty because they joined one march and don't have to do more. There's a lot more work to do. (I also found the sign that I should have made). 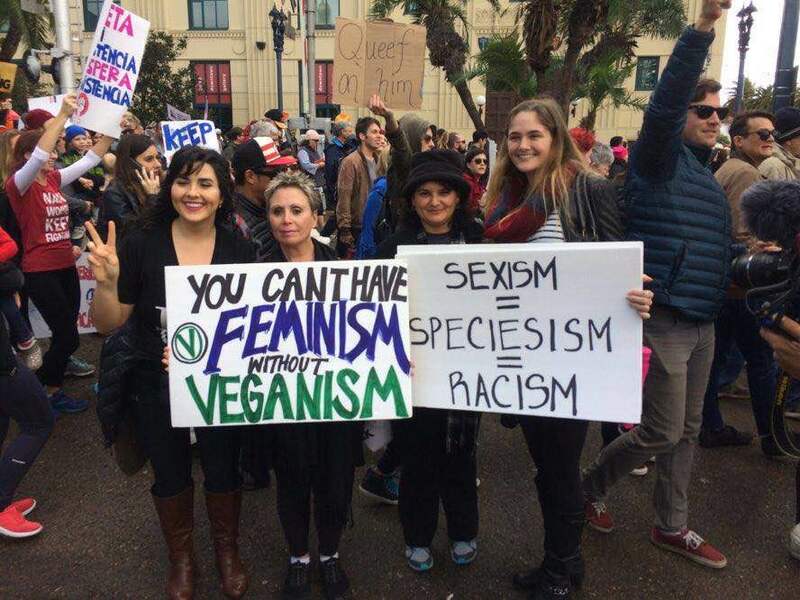 And below are some memes that connect feminism and/or other forms of social justice to veganism. Comment with your photos and I'll add them here!